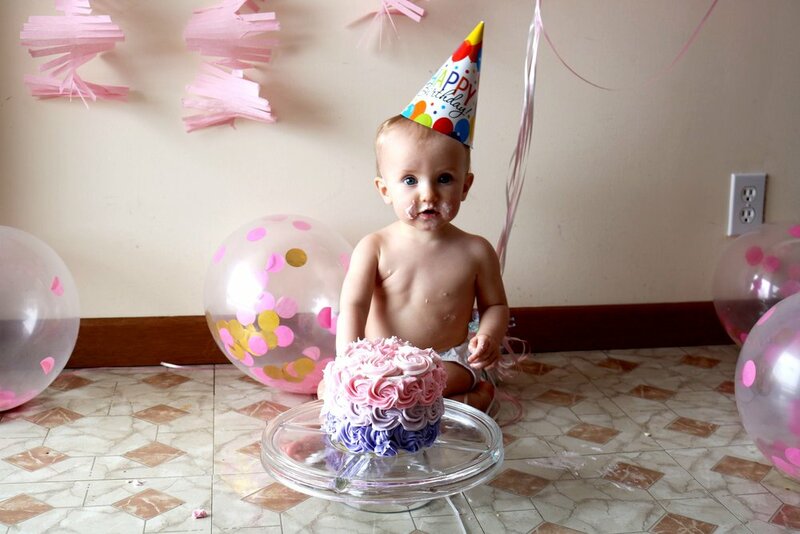 Claire turns one tomorrow. The past 364 days have been some of the most amazing and blessed days of my life. They have also been challenging, exhausting, and sometimes incredibly hard. There are so many things that no book or person or class can prepare you for as you learn to conquer the art of parenthood. I wanted to put into words some of the things I have realized in my first year as a new mother. The lack of sleep. And it’s a BIG #1. Everyone tells you to “get your sleep while you can” and just “sleep when the baby sleeps.” But it is SO much harder than that. The level of exhaustion that you will reach cannot be explained prior to you actually experiencing it. The first days home are the hardest, when the baby still needs to feed every 3-4 hours and is still trying to figure out its nights and days. Never mind the fact that you laboured for hours (or days) before the baby was born and you were already exhausted from that. As for “sleeping when the baby sleeps,” you will quickly realize that is your ONLY time to get ANYTHING done other than caring for a new life. If the laundry needs done, or the kitchen needs cleaned, you will get distracted with that and once the baby wakes up, you will realize you forgot to nap too. However, you will also realize how AMAZING the human body is and you will learn that you can function totally normal on this minimal sleep. Sleep deprivation will become your new normal and you will be totally okay with that. And once the baby does start sleeping, believe it or not, you will probably miss those middle-of-the-night feeds and cuddle sessions. The judgement you will have placed on you by other moms (and dads). And total strangers for that matter. As soon as anyone finds out you are pregnant or have a newborn, suddenly everyone seems to have an opinion. (Note above how everyone weighs in on when to get sleep)! People will judge you whether you decide to nurse, or bottle feed. If you rock your baby to sleep, people will tell you you’re spoiling her, but if you let them cry it out, then that’s cruel. If you go back to work, people will believe that you are neglecting your baby, but if you stay home then they will believe that you’re not motivated. People will stare (and comment) when you breastfeed in public. People will REALLY stare if your baby is crying in the grocery store thinking that you should be doing more to comfort them. If your baby isn’t sleeping through the night by the time they’re 6 months old, people will ask what you’re doing “wrong.” All of these things are real life examples that I have experienced first hand. All I can say is that since I have became a mom, I can honestly say that I no longer judge ANY parent for the way they decide to raise their child. There is absolutely no right or wrong way to do anything. You simply do what works for you and your baby, and that will be different for everyone. How quickly time will pass and they will grow. Everyone will surely tell you not to blink because they will be one, and then 10, and then 18 and gone away to college. You really cannot grasp just HOW quickly the time slips by until you experience it yourself. This past year has absolutely flown by. Some mornings when Claire wakes up, I swear she has grown over night. Every day she seems to learn something new and she not only grows bigger, but she develops her skills SO fast. First she holds her head up, and then she crawls, and then she says “mama”, and then she’s walking, and there is absolutely no slowing down. So, seriously, don’t blink. And take WAY too many pictures. You won’t regret it. The intensity of love you will feel for this tiny human. You definitely won’t know that it is possible to love something THIS much. For me, I have a spouse that I love dearly, and I of course love my family, but it is so true that a mother’s love is unconditional. There is something special and different. There will certainly be times when your baby will test you. Whether it’s when they’re a newborn and are seemingly crying for no reason at all hours of the morning, or when they are older and getting into EVERYTHING and throwing temper tantrums, it won’t matter. You will have moments of weakness, but it will never hinder the love you feel for them. I remember one night in particular when Claire was just a couple weeks old and was NOT sleeping. She wasn’t crying, but I remember feeling so frustrated because I so desperately wanted sleep. And then she smiled at me. And suddenly nothing else mattered. At that moment, sleep dropped several spots on the priority list. Sometimes I just need to look at Claire and tears of joy will pool in my eyes. There are so many more things that you will need to learn on the fly while raising a child. But, you will be surprised at how many things you DO know. Motherly instinct is real and you will rely on it. Babies unfortunately don’t come with an owner’s manual and every baby is so unique. One year ago exactly, Justin and I were on our way to the hospital. At that time, we didn’t even know if we were having a boy or a girl! Now, I can’t imagine my life without Claire. Life changed forever one year ago. And I wouldn’t change it for the world. Why did I start a blog? Why would I want to create a website to publish all of my ideas for the world to see? Why would I add another task to my already overwhelmingly busy life? The answer to me is simple - I LOVE to write. It is the absolute easiest way for me to express myself and what I want to share with the world. Lately, I have had an enormous amount of creative energy buzzing around in my head and I needed a platform to be able to let that energy out. Starting a blog has been a bucket list item of mine for years, and I’ve given up on finding excuses to put it off one more day. There is literally no better time than the present. Let me take this opportunity to introduce myself. I am a fourth generation farmer from a tiny hamlet called Welcome in Ontario, Canada. I was the middle child between two brothers who taught me what it meant to be “one of the boys” and never shy away from hard work or getting my hands dirty. My love for a good, home-cooked meal was developed a young age thanks to my mother and grandmother. I have a tremendous respect for our predecessors who worked so hard to clear the land our farms and cities were built on and pave the way to a better life. I have one daughter who is almost a year old and am engaged to be married in August 2019. I am going to keep this first post short and sweet and to the point. I am so excited to start sharing my thoughts on life with you all. But for now, let’s cultivate kindness, let’s cultivate creativity, and let’s cultivate a life well-lived.